All teachers know that a robust vocabulary gives students the communication skills they need to do well on tests and shine in the classroom—and the best way to ensure successful vocabulary instruction is to embrace new and engaging strategies that don't take too much time away from other work. To get the clock on their side and do what's best for their students, teachers need to learn how to provide short and effective vocabulary minilessons that can be used at any point during class. 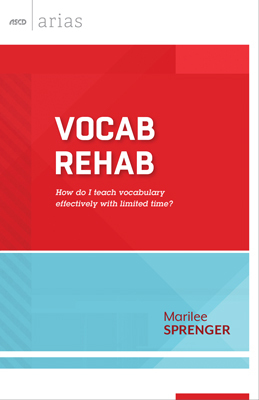 Marilee Sprenger's Vocab Rehab model offers teachers easy-to-implement, 10-minute instructional strategies that can help time-strapped teachers ensure that their students have a sound grasp of both general and content-specific words across grade levels and subject areas. "Overall, I found this to be a perfect read for what I’ve been trying to do in my classroom next year. I also think that some of her strategies could help with grammar instruction as well. This book really made me believe that vocabulary instruction is important, fun, and doable!"